Pearl McElfish, Ph.D.,(center) associate vice chancellor for the UAMS Northwest Regional Campus, coordinates with UAMS community health workers Terry Takamaru and Sammie Mamis. May. 18, 2017 | May 18, 2017 | A $2.1 million award from the Patient-Centered Outcomes Research Institute (PCORI) will allow the UAMS Northwest Regional Campus to continue and expand its research to identify effective ways to combat diabetes in the Marshallese community. The three-year award brings together researchers from the UAMS Office of Community Health and Research and the UAMS Center for Pacific Islander Health with the Marshallese community to study a culturally adapted diabetes prevention program designed to reduce the risk of type 2 diabetes by teaching people who have pre-diabetes how to make modest lifestyle changes that can prevent diabetes. The Marshallese have some of the highest documented rates of type 2 diabetes of any population group in the world. Health screenings by UAMS found that 41 percent have diabetes, compared to 9.3 percent of the U.S. population. Northwest Arkansas has more than 11,000 Marshallese in the region — the largest community of Marshallese in the continental U.S.
“The goal of this research is to reduce disparities related to type 2 diabetes within the Marshallese community,” said Pearl McElfish, Ph.D., associate vice chancellor for the UAMS Northwest Regional Campus, co-director of the Center for Pacific Islander Health and the principal investigator on this project. “This particular study was conceived by working with members of the community — largely through churches — to identify the health questions that the Marshallese in Arkansas most want answered,” said McElfish, also an assistant professor in the College of Medicine Department of Internal Medicine. The study will be implemented within Marshallese churches, comparing the effectiveness of the standard Diabetes Prevention Program Lifestyle Intervention with a culturally adapted Pacific Diabetes Prevention Program Lifestyle Intervention. “When UAMS first met with members of the Marshallese community, we talked about how diabetes was such a problem for our community, and finding a better way to treat and to prevent diabetes is very important to us,” said Wanna Bing, senior project manager for UAMS. The Walmart Foundation is also supporting this research. In December 2016, it awarded a $125,000 grant to the program. 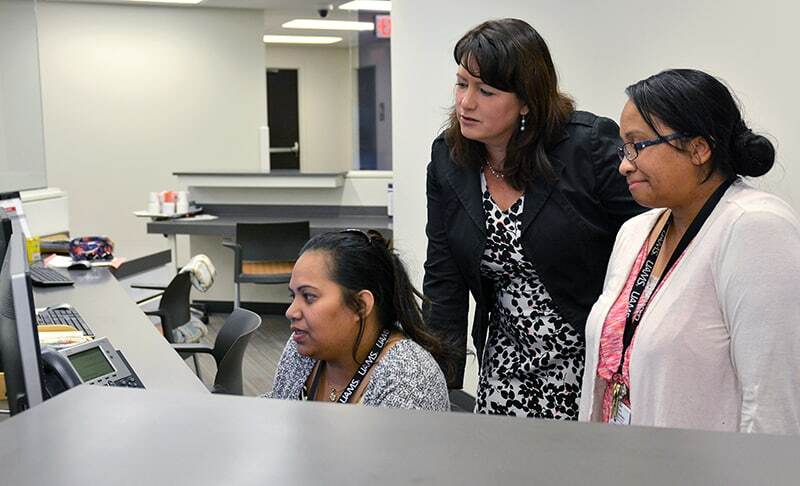 Since 2014, more than $10 million has been awarded to the UAMS Northwest Regional Campus to reduce health disparities in both Marshallese and Hispanic residents of Benton and Washington counties. “This study continues the valuable research on diabetes that UAMS is conducting with the Marshallese community,” said Peter Kohler, M.D., former UAMS vice chancellor and a co-investigator on this project who has received PCORI funding for previous research on diabetes and Pacific Islanders. The Patient-Centered Outcomes Research Institute (PCORI) is an independent, nonprofit organization authorized by Congress to fund comparative clinical effectiveness research.